Citation: Whitley, M.A., Farrell, K., Wolff, E.A., & Hillyer, S.J. (2019) Sport for development and peace: Surveying actors in the field. Journal of Sport for Development, 7(11),1-15. The sport for development and peace (SDP) field has experienced rapid growth since the late 1990s (Coalter, 2010), with an increasing number of initiatives, events, organizations, and networks (e.g., Beyond Sport Awards, streetfootballworld, Up2Us Sports, Laureus Sport for Good Foundation). At this time, over 950 organizations are listed on the International Platform on Sport and Development (compared with 176 organizations in July 2006; Levermore, 2008), with an estimated 10 new organizations created each month using sport to reach specific outcomes (Hayhurst & Frisby, 2010). Growing political and institutional support has resulted in expanded opportunities for funding and the production of scholarship (e.g., Journal of Sport for Development, UK Economic and Social Research Council, Norwegian Agency for Development Cooperation, U.S. Department of State Sports Diplomacy Division; (Schulenkorf, Sherry, & Rowe, 2016) , along with an increasing number of employment opportunities within SDP and related fields (Whitley, McGarry, Martinek, Mercier, & Quinlan, 2017). For example, since 2013, one SDP website has posted over 500 jobs in the field in the United States, and a global SDP website has posted 347 jobs around the world (sportanddev.org, 2017; Up2UsSports, 2017). Despite this growth, previous critiques cite the loose, unorganized, and isolated nature of the SDP field (Kidd, 2008; Massey, Whitley, Blom, & Gerstein, 2015). Recent attempts in the academic literature have been made to address these concerns, seeking to synthesize the knowledge within the SDP field, including: (a) an integrative review of sport for development literature by Schulenkorf et al. (2016); (b) an integrative review of sport-based youth development literature by Jones, Edwards, Bocarro, Bunds, and Smith (2017); (c) a systematic review of life skill development through sports programs serving socially vulnerable youth by Hermens, Super, Verkooijen, and Koelen (2017); (d) a systematic map of the evidence on sport for development’s efficacy in Africa by Langer (2015); (e) a qualitative meta-study of positive youth development through sport by Holt et al. (2017); (f) a systematic map of the current state of sport for development research by Cronin (2011); (g) a literature review of positive youth development through sport by Coakley (2011); and (h) a scoping review of SDP interventions targeting Aboriginal youth in Canada by Gardam, Giles, and Hayhurst (2017). Additionally, Whitley and colleagues (Whitley et al., 2018; Whitley, Massey, Camiré, Boutet, & Borbee, 2019) have critically appraised both quantitative and qualitative evidence in academic and grey literature in the SDP field in six global cities (Cape Town, Hong Kong, London, Mumbai, Nairobi, and New Orleans) and throughout the United States. 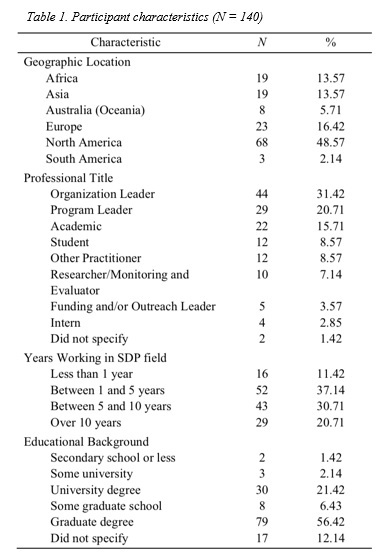 All of these efforts have provided a relatively comprehensive understanding of the current state of SDP as described in the literature, including but not limited to: (a) program design and implementation (e.g., resources/inputs, geographical contexts, sport activities, outputs, level of development, leadership, contextual assets), (b) research and program evaluation (e.g., research foci, theoretical frameworks, methodologies, methods, key research findings), and (c) publication trends (e.g., authorship, journals). However, minimal attention has been given to the experience and expertise of the growing number of SDP actors (e.g., practitioners, scholars, students). The few publications that have featured SDP actors have focused on their motivations for engaging in the field (e.g., volunteers, scholars, practitioners; Welty Peachey, Cohen, & Musser, 2016; Welty Peachey, Lyras, Cohen, Bruening, & Cunningham, 2014; Welty Peachey, Musser, Shin, & Cohen, 2018) , partnership experiences within the field (Hayhurst, Wilson, & Frisby, 2011), perceptions of impact on the participants, community, and/or society (Schulenkorf, Sugden, & Burdsey, 2014; Spaaij, Magee, & Jeanes, 2013; Whitley, Hayden, & Gould, 2016), and impact on the actors themselves (e.g., volunteers, celebrity athletes; Darnell, 2010, 2012; Welty Peachey, Bruening, Lyras, Cohen, & Cunningham, 2015; Wilson, Van Luijk, & Boit, 2015). As yet, there has not been a systematic assessment of SDP actors’ experiences in and perceptions of the SDP field. This is concerning, given that human resources are critical for success in the SDP field (Svensson & Hambrick, 2016). The purpose of this paper is to present the results of a questionnaire designed to enhance our understanding of the SDP field through the eyes (and experiences) of SDP actors. The intention is to use responses to assess the current state of the SDP field, as well as outline recommendations for ways in which the field can be improved. In order for the SDP field to continue growing and developing, we must ensure that actors currently engaged in SDP have the knowledge, support, and resources required to be (and feel) efficacious. Understanding their experiences in and expectations of the SDP field will help us identify strengths and weaknesses that must be addressed, along with accruing a set of recommendations from those who are actively engaged in SDP. The criteria for inclusion in this study were being active in SDP and being at least 18 years of age. The demographic variables for the 140 participants in this study are outlined in Table 1. The majority of participants identified as working within SDP organizations, either at the organizational (31.42%) or programming level (20.71%), along with “other practitioners” in the SDP field (e.g., consultants, sport psychologists). The academics (15.71%) included professors, lecturers, and university department directors. Of the 140 total participants, 120 have engaged in higher education, with 62 participants (44.28%) earning degrees in a related field (e.g., sport psychology, sport management, physical education, kinesiology, peace studies, sport-based youth development, education). Alternatively, 58 participants (41.42%) have degrees in an unrelated field (e.g., political science, general psychology, international relations, law, business administration), with the majority of these individuals identifying as practitioners. A multidisciplinary team developed the questionnaire based on their experiences and expertise in the SDP field, along with foundational knowledge of the SDP literature. The questionnaire was then reviewed by six SDP experts with a variety of academic and practical experiences in different geographic locations, with a request for feedback on content validity. Their feedback was incorporated into the final questionnaire, which was composed of 33 open-ended questions organized within the following domains: (a) demographics (8 questions), (b) SDP field (7 questions), (c) professional development (8 questions), and (d) professional associations (10 questions). The study procedures were approved by the lead investigator’s Institutional Review Board. Participation in the questionnaire was interpreted as informed consent, with participants only able to access the online questionnaire after reading an information page, including the voluntary and anonymous nature of the study. Since an exhaustive list of all SDP actors is nonexistent, recruitment procedures were comprised of various methods to ensure wide distribution. This included, but was not limited to, announcements posted on listservs, newsletters, blogs, and social media. Additionally, the research team accessed their personal and professional network of SDP actors in-person and via email and telephone. Data were collected over seven months to increase the number and variety of respondents, with multiple communication attempts via the previously listed channels. Within the set of the responses for each question, content analysis was conducted in which two investigators independently identified common themes in the data, grouping the data into lower and higher order themes (Strauss & Corbin, 1998). At each stage (i.e., lower order themes, higher order themes), these two investigators engaged in critical discussions about ways the data should be categorized, ultimately coming to consensus regarding how to progress (Sparkes & Smith, 2009). A tertiary investigator also served as a peer debriefer to increase the analytical rigor. Additionally, the responses within each lower and higher order theme were carefully reviewed to determine whether patterns emerged in the responses based on the demographic variables collected: (a) geographic location, (b) professional title, (c) years working in the SDP field, and/or (d) educational background. In the section below, any patterns that did emerge within the themes discussed in the text are identified. The SDP field has been critiqued about a lack of clarity, which begins with the term itself. First, “development” and “peace” are vague, amorphous, complex terms (Sugden, 2010), with matters complicated by contestations about the name of the SDP “movement”: “What exactly is SDP? Moreover, one could ask what is Sport-Based Youth Development? How does this differ from SDP? What is simply Sport for Development? And why differentiate between Sport for Development and Sport for Development and Peace?” (Massey & Whitley, 2019, p. 175) All of these terms—and more (e.g., sport-in-development, development through sport, positive youth development through sport)—have been used to describe the SDP “movement,” with even greater diversity, complexity, and obfuscation in the definitions of these terms. In addition to identifying the outcomes and impact sought through SDP, 15 participants also described SDP as a way in which sport, physical activity, and play were used intentionally through curriculum, programming, and educational and pedagogical tools. Similarly, Hamilton (1999) defined youth development in three ways: (a) a natural progression of learning, growing, and changing; (b) a philosophy of understanding youth; and (c) a method for working with youth. Thus, these 15 participants who included this focus on the method of engaging with others through sport connect with Hamilton’s third description. Interestingly, six of the seven participants who focused on formal curriculum and programming had achieved a degree in higher education, which suggests this focus on methodology may skew toward those with experiences in higher education. In sum, participants’ definitions of SDP were varied and complex, with much to say. As the SDP field has grown and transformed over the last 20 years, there has been growing interest in accessing information, although the type of information most sought by SDP actors is not fully known. When study participants were asked what information they sought most in SDP (see Table 3), there was a resounding focus on methods and methodologies (mostly by practitioners), from measurement and evaluation to program design and curriculum. Specifically, participants were interested in enhancing their knowledge and skills related to measurement and evaluation of SDP programs, along with access to effective tools, methods, and frameworks. P58 (coordinator of sport and development) called for “guidelines for monitoring and evaluation,” while P102 (education director) asked about the “most effective and honest ways to monitor and evaluate impact.” Given concerns about rigor and quality in SDP research and evaluation (Jeanes & Lindsey, 2014; Langer, 2015; Massey & Whitley, 2019; Whitley et al., 2018, 2019), this interest in research and evaluation methods and methodologies is not surprising, even for those with higher education experience, given so few in the SDP field studied research and evaluation methods and methodologies broadly—or in SDP specifically. Additionally, interest in information related to program design and curriculum matches recent calls for more intentional and systematic use (and dissemination) of program theories (e.g., theories of change, logic models; Coalter, 2015; Jones et al., 2017; Lyras & Welty Peachey, 2011; Whitley et al., 2018). Through program theories, conditions and mechanisms are identified that explain why certain outcomes and impacts are (not) reached (Coalter, 2013; Weiss, 1995), allowing SDP actors to intentionally (and effectively) promote specific outcomes and impacts. Without this knowledge, SDP programs are magical black boxes “whose contents and processes are taken for granted” (Coalter, 2007, p. 90). The participants (largely practitioners) in this study were interested in moving beyond this, seeking to understand process-based and evidence-informed program design and curriculum development (Coalter, 2010). Additionally, there exists a set of reviews that have synthesized the (albeit limited) knowledge within the SDP field, with findings identifying best practices as it relates to program design and implementation that should be accessible to SDP actors (Hermens et al., 2017; Holt et al., 2016; Jones et al., 2017; Schulenkorf et al., 2016). There is a need to make these reviews widely accessible to practitioners, given the implications for the continued growth and development of the SDP field. Participants were also extremely interested in learning more about impact, from accessing current research in SDP (to comprehend the most impactful practices) to understanding the outcomes and impact in the SDP field. In the words of P66 (associate professor), I want to know “more about the actual programs being implemented and the impact they are having.” This is a barrier to the growth and development of the SDP field, with Darnell, Chawansky, Marchesseault, Holmes, and Hayhurst (2018) highlighting the “importance of access to and dissemination of SDP research for both academics and practitioners” (p. 143). This yearning (largely by practitioners) for greater access to current SDP research may reflect the fact that many academic publications are hidden behind paywalls, while program evaluations are rarely made public, thereby directly and indirectly preventing most actors from accessing this information (Gardam et al., 2017). There is also a gap in local knowledge, with a need to better understand impact outside of traditional academic outlets. As Nicholls, Giles, and Sethna (2011) highlight, evidence about sport’s impact exists in local and indigenous communities, but this knowledge is rarely accessed or distributed. In P55’s (chief program officer) words, it would be helpful to have “up to date research being done within the field,” while P114 (regional program manager) stated: “I would like to know about the continuing research in the area.” Almost all of the 19 participants interested in accessing current research were practitioners from countries outside of North America, suggesting a practitioner-scholar divide that is particularly salient for non-North American practitioners. When participants were asked how they currently access information about the field, a number of collaboratives, coalitions, and think tanks were mentioned (e.g., BeyondSport.org, SportandSocialChange.org, streetfootball world, Coaches Across Continents, Peace and Sport), along with individual SDP organizations, the United Nations (although the Office on Sport for Development and Peace is now closed), conferences, listservs, and newsletters. However, the most frequently cited methods were sportanddev.org (mostly by practitioners), academic articles and books (largely by scholars and students), colleagues and partners (predominantly by practitioners and scholars), and (broadly) the internet (largely by practitioners). When participants were asked whether these existing resources adequately provided them with the information they needed, 65.85% indicted “no” or “somewhat,” suggesting a need for improvement in this area. Ideally, this platform would unlock access to knowledge, resources, research, and training/education opportunities, addressing P89’s (student and graduate assistant) suggestion for “a more effective way to get information out about the sector to those working in the sector. Not just researchers.” This could also address concerns about transparency in the field, with P33 (director of monitoring and evaluation) recommending more transparency with “sharing materials and curricula…it’s difficult to find concrete toolkits. I do believe that these exist, but organizations are reluctant to share them publicly online, so knowledge isn’t getting transferred across the sector.” Similarly, P91 (sales and marketing manager) suggested all actors should “be open and willing to share your information. I understand that intellectual property is a big deal and you want to be able to maintain control of your product, but we should be working together to achieve greater SDP internationally.” While transparency may be sought, Hayhurst and colleagues (2010) found that some SDP nongovernmental organizations perceived cooperation in sharing best practices or collaborating on toolkits as “potentially threatening to their existence,” particularly in an environment that fostered “competition for scarce resources” (p. 322). Thus, if there is interest in unlocking access to information across the SDP field, there may need to be a stronger rationale and comprehensive support for approaches that deconstruct silos through awareness, discourse, cooperation, and collaboration, such as systems thinking (Massey et al., 2015), collective impact (Kania & Kramer, 2011), and transnational/global impact (Darnell et al., 2018). For example, systems thinking helps organizations “move beyond linear, isolationist, individualistic planning, implementation, and evaluation” (Massey et al., 2015, p. 33) that often carries the assumption that sustainable change on the macro-level (i.e., impact) will ultimately occur through cumulative program-level outcomes. However, this rarely occurs unless programs intentionally align local efforts to societal action (Ricigliano, 2012). This can occur through systems thinking, which encourages organizations to acknowledge the messy, complex, and dynamic social ecological systems in which SDP programs operate (Green, 2006) by seeking to understand, engage, cooperate, and collaborate with individuals (e.g., parents, peers, youth workers, teachers) and bodies (e.g., school, funders, government, corporations; Massey & Whitley, 2019). While this certainly requires a different approach to planning, implementation, and evaluation, along with more comprehensive support for these efforts, there is greater potential for macro-level, sustainable impact. Overall, the information sought by the participants in this study, along with the ways in which it is (or could be) accessed, serve as a reminder of missed opportunities in the field. The majority of study participants (particularly those identifying as practitioners) were unsatisfied, with a sizeable gap between information and access. These recommendations are a starting point for unlocking access for all actors in the SDP field. A number of concerns about the field of SDP were raised by study participants (see Table 4), with these concerns distributed across five themes: (a) field obscurity/confusion, (b) disjointed/disorganized field, (c) limited support, (d) ineffective/inequitable practices, and (e) unclear impact. This connects to the call for systems thinking (Massey et al., 2015), collective impact (Kania & Kramer, 2011), and transnational/global impact cited earlier (Darnell et al., 2018). Additionally, P58 (coordinator of sport and development) explained how SDP is “not always acknowledged that much in comparison with other interventions in the development sector,” suggesting a need for more effective messaging to other sectors and institutions (Black, 2010), with non-sport programming, with government, education, health, and other social services (Hartmann &Kwauk, 2011), with high performance sport (Hayhurst & Frisby, 2010), and with stakeholders in communities and policy (Massey et al, 2015). This enhances the likelihood of awareness, discourse, cooperation, and collaboration within and beyond SDP. This reflects concerns by practitioners and academics about neocolonial approaches to SDP that subjugate or colonize practice and/or knowledge, with SDP programs frequently designed, funded, and/or evaluated in/by the Global North for implementation in the Global South, without meaningful engagement with local stakeholders (Coalter, 2013; Jeanes & Lindsey, 2014; Nicholls et al., 2011). Along with concerns about inequitable practices are concerns related to ineffective practices, with participants citing inadequate or missing training for all SDP actors (e.g., researchers, coaches, administrators). While the participants spoke of this concern in the field more broadly, it may also reflect their own education and training, with 41.42% of the participants with higher education degrees studying fields unrelated to SDP. This matches findings from Welty Peachey et al. (2016), with most practitioners stumbling into SDP from other vocations, without SDP-specific education or training. This is concerning, given the growing number of employment options in SDP, particularly for leadership positions (e.g., director, manager, coordinator; Whitley et al., 2017). While there are some training routes for those implementing SDP activities (e.g., coaches, teachers, community leaders), there is a significant gap in formal training and education for those interested in leadership positions, along with preparation for those currently in entry- and mid-level positions seeking to advance their careers (Lindsey et al., 2015; Whitley et al., 2017). Welty Peachey and colleagues (2016) connected this gap to a potential explanation for SDP organizational failure, with SDP-specific educational backgrounds and development, managerial, and entrepreneurial skills and experience a key to SDP sustainability. However, caution must be taken to avoid perpetuating the neocolonial and inequitable practices that participants cited, with SDP education and training designed for all SDP actors carefully considered and developed. “Institutions of higher education, NGOs, and other development agencies” must “advance critical and contemporary relevant education that moves beyond neocolonialism and neoliberalism and recognizes the value and acumen of local knowledge along with a willingness to adapt to one’s surrounding community” (Welty Peachey et al., 2016, p. 16). This quote, and others in the data, raise awareness about the obscurity (i.e., the magical black box; Coalter, 2007) that exists when it comes to the most effective practices in SDP. There is a need to move beyond this (as discussed above), through both the intentional and systematic use (and dissemination) of program theories (e.g., theories of change, logic models; Coalter, 2015; Jones et al., 2017; Lyras & Welty Peachey, 2011; Whitley et al., 2018) and easy, equitable access to recent SDP reviews that report some of these practices. This connects to the final theme that emerged in this section (i.e., unclear impact), with the participants highlighting gaps in research and evidence-informed practice. Most of these participants were currently working in academia or in the area of monitoring and evaluation in the field, with P29 (chief executive strategist) stating, “there isn’t enough research for [SDP] to be taken as seriously as other development initiatives.” This matches findings in the field, where SDP is considered “out of step with the current drive towards evidence-informed development,” with a “need for reliable research and evaluation data to inform the design of policies and programmes” (Langer, 2015, p. 69). Currently, there is a limited evidence base in SDP that is largely reliant on isolated impact evaluations, with questions about rigor, concerns about what constitutes sufficient evidence, and few structured evaluation tools and manuals (Jeanes & Lindsey, 2014; Langer, 2015; Massey & Whitley, 2019; Whitley et al., 2018, 2019). There is a need for more rigorous, systematic research and evaluation efforts and tools that are openly shared with all actors in SDP. In sum, the findings related to concerns with SDP as a field correlate with the academic literature that cites concerns related to the loose, unorganized, and isolated nature of the SDP field (Massey et al., 2015), with Kidd (2008) referring to the SDP “movement” as “woefully underfunded, completely unregulated, poorly planned and coordinated and largely isolated from mainstream development efforts” (p. 376). This matches findings outlined earlier, in which participants identified the information they sought most in SDP and recommendations of how this information could be more readily accessed. This need for better collaboration and partnerships within and beyond SDP is grounded in the concerns cited earlier about the isolation of SDP for both academics and practitioners, reinforcing the call for systems thinking (Massey et al., 2015), collective impact (Kania & Kramer, 2011), and transnational/global impact (Darnell et al., 2018). While there are certainly guidelines that should be carefully considered when seeking, creating, and sustaining collaborations and partnerships (Keyte et al., 2018), and concerns have been raised about the potential detriments of collaboration and information sharing (e.g., competition for scarce resources; Hayhurst & Frisby, 2010; Welty Peachey et al., 2014), there is too much to be gained from such strategic efforts to ignore ongoing calls for collaboration and partnerships. The benefits include enhanced structural capacity within organizations (e.g., processes, practices, accumulated knowledge, support structures; Hall et al., 2003)and contextualized, holistic approaches to research. This is congruent with the academic dialogue within SDP (discussed earlier), with an identified need for more rigorous, systematic research and evaluation efforts that engage all SDP actors, value all forms of knowledge and expertise, and are accessible and applicable to all SDP actors. Overall, participants from varied geographic locations identified recommendations for meaningful, rigorous research, collaboration and partnerships, and access to resources and research, suggesting these are salient recommendations for the SDP field. Similar to the ways in which they access information about SDP, study participants described accessing professional development from a variety of conferences, workshops, and events, along with university courses and professional associations, collaboratives, and coalitions (e.g., Up2Us Sports, TPSR Alliance, Association for Applied Sport Psychology). Additionally, participants spoke of informal professional development through conversations with colleagues and field visits to local organizations, in addition to accessing articles in academic journals and online news outlets. When asked what was missing from current professional development opportunities, many recommendations aligned with the concerns cited above, such as greater accessibility to resources (e.g., research, curriculum funding) and an informed network (e.g., experts in the field), along with training and education that was targeted, with hands-on opportunities for learning and development. However, there was interest in global expansion of professional development opportunities, along with greater grassroots involvement, as “grassroot organizations are not represented or their projects are not supported” (P62, chief executive officer). This connects with the previously cited concerns of neocolonialism and power imbalances within the field (Coalter, 2013; Jeanes & Lindsey, 2014; Nicholls et al., 2011). Furthermore, participants wished for more consistency, with professional development opportunities “few and far between” (P49, senior director of baseball/softball). A final theme that emerged was interest in ongoing support and follow-up, whether in the form of “resources for follow-up activities back in the organization” (P11, program manager) or “sustained and ongoing mentoring/coaching” (P82, education programming director). This paper represents another step forward in the growth and development of the SDP field by presenting the results of a questionnaire designed to enhance our understanding of the sector through the eyes and experiences of SDP actors. The findings reveal and confirm many of the same challenges recognized and debated since the inception of SDP as a field of study and practice. There remains an eager desire for an organized field and a united, clear definition of SDP, along with consistent language to describe the work and the intended outcomes. Additionally, SDP actors are interested in accessing a wide range of information about the field, with practitioners especially interested in information related to methods and methodologies (e.g., monitoring and evaluation, program and curriculum design) and meaningful, rigorous research. Finally, there remains interest in improved, accessible training and support for future practitioners, managers, and researchers in SDP, along with enhanced opportunities for meaningful collaboration and partnerships. The participants in this study represented a subset of a larger population engaged in SDP, and so we acknowledge there is much more to learn from one another – particularly from those who were not meaningfully represented (if at all) in this questionnaire: (a) those implementing SDP activities (e.g., coaches, teachers, community leaders); (b) community stakeholders collaborating with SDP activities (e.g., community leaders, parents); and (c) those engaged in SDP activities (e.g., youth, persons with disabilities). Additionally, while we acknowledge that many of the findings in this paper will be familiar to those deeply engaged in SDP, we hope the field benefits from empirical evidence that supports what so many of us experience on an individual level. We believe there is tremendous potential for this field, but this potential can only be fully realized when all of its actors have the knowledge, support, and resources to be (and feel) efficacious. The authors thank the SDP experts who reviewed the questionnaire, along with the participants who took part in the study. The final version of the survey is available upon request from the first author. Black, D. R. (2010). The ambiguities of development: implications for “development through sport.” Sport in Society, 13(1), 121-129. Coakley, J. (2011). Youth sports: What counts as “positive development?” Journal of Sport and Social Issues, 35(3), 306-324. Coalter, F. (2007). What is the development in sport-for-development? In B. Segaert, M. Theeboom, C. Timmerman, & V. Vanreusel (Eds. ), Sports governance, development and corporate responsibility (pp. 88-104). New York, NY: Routledge. Coalter, F. (2010). The politics of sport-for-development: Limited focus programmes and broad gauge problems? International Review for the Sociology of Sport, 45(3), 295-314. Coalter, F. (2013). Sport for development: What game are we playing? London, UK: Routledge. Coalter, F. (2015). Sport-for-change: Some thoughts from a sceptic. Social Inclusion, 3(3), 19-23. Collison, H., & Marchesseault, D. (2018). Finding the missing voices of Sport for Development and Peace (SDP): Using a “Participatory Social Interaction Research” methodology and anthropological perspectives within African developing countries. Sport in Society, 21(2), 226-242. Cronin, O. (2011). Comic relief review: Mapping the research on the impact of sport and development interventions. Manchester, UK: Orla Cronin Research. Darnell, S. C. (2010). Power, politics and “Sport for Development and Peace”: Investigating the utility of sport for international development. Sociology of Sport Journal, 27(1), 54-75. Darnell, S. C. (2012). Paying the price for speaking out: Athletes, politics and social change. International Council of Sport Science and Physical Education special bulletin, 63. Darnell, S. C., Chawansky, M., Marchesseault, D., Holmes, M, & Hayhurst, L. (2018). The state of play: Critical sociological insights into recent “Sport for Development and Peace” research. International Review for the Sociology of Sport, 53, 133-151. Gardam, K., Giles, A. R., & Hayhurst, L. M. C. (2017). Sport for development for Aboriginal youth in Canada: A scoping review. Journal of Sport for Development, 5(6), 30-40. Green, L. W. (2006). Public health asks of systems science: To advance our evidence-based practice, can you help us get more practice-based evidence? American Journal of Public Health, 96(3), 406-409. Hall, M., Andrukow, A., Barr, C., Brock, K., de Wit, M., Embuldeniya, D., … Vaillancourt, Y. (2003). The capacity to serve: A qualitative study of the challenges facing Canada’s nonprofit and voluntary organizations. Toronto, ON: Canadian Centre for Philanthropy. Hamilton, S. F. (1999). A three-part definition of youth development [Unpublished manuscript]. Ithaca, NY: Cornell University College of Human Ecology. Hartmann, D., & Kwauk, C. (2011). Sport and development: an overview, critique, and reconstruction. Journal of Sport and Social Issues, 35(3), 284-305. Hayhurst, L. M., Wilson, B., & Frisby, W. (2011). Navigating neoliberal networks: Transnational internet platforms in sport for development and peace. International Review for the Sociology of Sport, 46(3), 315-329. Holt, N. K., Deal, C. J., & Smyth, C. L. (2016). Future directions for positive youth development through sport. In N. K. Holt (Ed. ), Positive youth development through sport (pp. 231-240). Milton Park, UK: Routledge. Holt, N. L., Neely, K. C., Slater, L. G., Camiré, M., Côté, J., Fraser-Thomas, J., … Tamminen, K. A. (2017). A grounded theory of positive youth development through sport based on results from a qualitative meta-study. International Review of Sport and Exercise Psychology, 10, 1-49. Jeanes R., & Lindsey, I. (2014). Where’s the “evidence”? Reflecting on monitoring and evaluation within sport-for-development. In K. Young & C. Okada (Eds. ), Sport, social development and peace (Vol. 8, pp. 197-217). Bingley, UK: Emerald. Jones, G. J., Edwards, M. B., Bocarro, J. N., Bunds, K. S., & Smith, J. W. (2017). 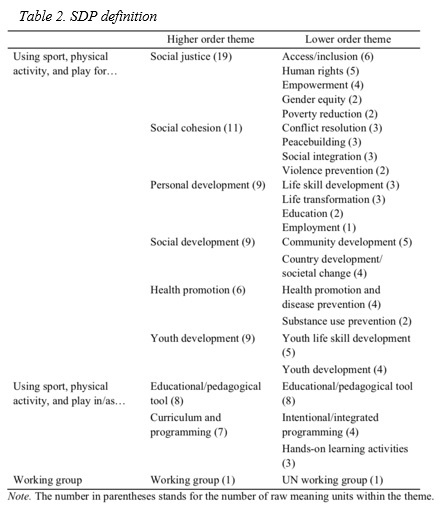 An integrative review of sport-based youth development literature. Sport in Society, 20, 161-179. Kania, J., & Kramer, M. (2011). Collective impact: Large-scale social change requires broad cross-sector coordination, yet the social sector remains focused on the isolated intervention of individual organizations. Stanford Social Innovation Review, 9(1):36-41. Keyte, T., Whitley, M. A., Sanders, B. F., Rolfe, L., Mattila, M., Pavlick, R. & Ridout, H. B. (2018). A winning team: Scholar-practitioner partnerships in sport for development. In D. Van Rheenen & J. M. DeOrnellas (Eds. ), Envisioning scholar-practitioner collaborations: Communities of practice in education and sport (pp. 3-18). Charlotte, NC: Information Age Publishing. Langer, L. (2015). Sport for development: A systematic map of evidence from Africa. South African Review of Sociology, 46(1), 66-86. Levermore, R. (2008). Sport: A new engine of development? Progress in Development Studies, 8(2), 183-190. Lyras, A., & Welty Peachey, J. (2011). Integrating sport-for-development theory and praxis. Sport Management Review, 14(4), 311-326. Massey, W. V., & Whitley, M. A. (2019). SDP and research methods. In S. Darnell, R. Giulianotti, D. Howe, & H. Collison (Eds. ), Routledge Handbook on Sport for Development (pp. 175-184). Abingdon, UK: Routledge. Massey, W. V., Whitley, M. A., Blom, L., & Gerstein, L. (2015). Sport for development and peace: A systems theory perspective on promoting sustainable change. International Journal of Sport Management and Marketing, 16, 18-35. Nicholls, S., Giles, A. R., & Sethna, C. (2011). Perpetuating the “lack of evidence” discourse in sport for development: Privileged voices, unheard stories and subjugated knowledge. International Review for the Sociology of Sport, 46(3), 249-264. Schulenkorf, N., Sherry, E., & Rowe, K. (2016). Sport for development: An integrated literature review. Journal of Sport Management, 30, 22-39. Schulenkorf, N., Sugden, J., & Burdsey, D. (2014). Sport for development and peace as contested terrain: Place, community, ownership. International Journal of Sport Policy and Politics, 6(3), 371-387. Spaaij, R., Magee, J., & Jeanes, R. (2013). Urban youth, worklessness and sport: A comparison of sports-based employability programmes in Rotterdam and Stoke-on-Trent. Urban Studies, 50(8), 1608-1624. Sparkes, A. C., & Smith, B. (2009). Judging the quality of qualitative inquiry: Criteriology and relativism in action. Psychology of Sport and Exercise, 10(5), 491-497.
sportanddev.org. International Platform on Sport and Development. 2017; http://www.sportanddev.org. Strauss, A., & Corbin, J. (1998). Basics of qualitative research: Techniques and procedures for developing grounded theory. Newbury Park, CA: Sage Publications. Sugden, J. (2010). Critical left-realism and sport interventions in divided societies. International Review for the Sociology of Sport, 45(3), 258-272. Weiss, C. (1995). Nothing as practical as good theory: Exploring theory-based evaluation for comprehensive community initiatives for children and families. In J. Connell, A. Kubisch, L. Schorr, & C. Weiss (Eds. ), New approaches to evaluating community initiatives (pp. 65-92). Washington, DC: Aspen Institute. Welty Peachey, J., Bruening, J., Lyras, A., Cohen, A., & Cunningham, G. B. (2015). Examining social capital development among volunteers of a multinational sport-for-development event. Journal of Sport Management, 29(1), 27-41. Welty Peachey, J., Cohen, A., & Musser, A. (2016). “A phone call changed my life”: Exploring the motivations of sport for development and peace scholars. Journal of Sport for Development, 4(7), 58-70. Welty Peachey, J., Lyras, A., Cohen, A., Bruening, J. E., & Cunningham, G. B. (2014). Exploring the motives and retention factors of sport-for-development volunteers. Nonprofit and Voluntary Sector Quarterly, 43(6), 1052-1069. Welty Peachey, J., Musser, A., Shin, N. R., & Cohen, A. (2018). Interrogating the motivations of sport for development and peace practitioners. International Review for the Sociology of Sport, 53(7), 767-787. Whitley, M. A., Hayden, L. A., & Gould, D. (2016). Growing up in the Kayamandi Township: II. Sport as a setting for the development and transfer of desirable competencies. International Journal of Sport and Exercise Psychology, 14, 305-322. Whitley, M. A., Massey, W. V., Camiré, M., Boutet, M., & Borbee, A. (2019). Sport-based youth development interventions in the United States: A systematic review. BMC Public Health, 19, 89-109. Whitley, M. A., McGarry, J., Martinek, T., Mercier, K., & Quinlan, M. (2017). Educating future leaders of the sport-based youth development field. Journal of Physical Education, Recreation & Dance, 88(8), 15-20. Wilson, B., Van Luijk, N., & Boit, M. K. (2015). When celebrity athletes are “social movement entrepreneurs”: A study of the role of elite runners in run-for-peace events in post-conflict Kenya in 2008. International Review for the Sociology of Sport, 50(8), 929-957.